Griffiths Racing :: Make Mine A Winner! It is always gratifying to see a young horse improve at each outing and that has certainly been the case with the promising Make Mine Hennessy... third at her Bendigo debut, runner-up at Mornington 11 days later and at Sale on Sunday... a breakthrough! Eased back from cover having been caught wide early, Make Mine Hennessy was patiently steered by the in-form Martin Seidl who reported that he was confident throughout the run - "I was always in the situation where I knew she was going to win the race," he said. Beginning her run around them approaching the turn, Make Mine Hennessy was five wide into the straight - ready to chase. And that she did, showing good heart as favourite Pinyin got clear. The pair were in a race of their own over the final 100m but it was our girl who put her nose out where it counted - "she was fighting to the line," Seidl said. "They found the perfect race for her," he continued. "She ran two good races before today; she had run on well. I was a bit badly drawn today but she came around them easily." "She was still a bit keen, a bit hot but hopefully she can slow down a bit in the head... she can have a nice career." "She always gives her all," said a happy Beth Schroen who gave a cheer when the photo finish result went up - "I was standing in front of the finish line and I thought the inside had us so it was a pleasant surprise." "She has always shown a lot of talent on the training track and has just taken a bit of time to learn to relax. 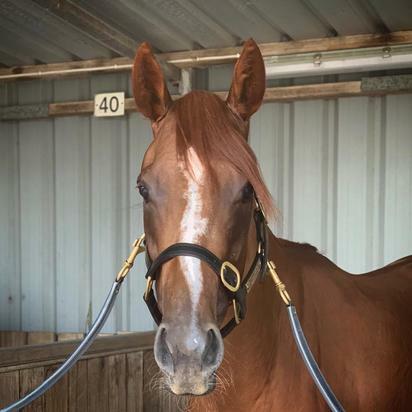 She is a bit quirky, a bit hot - but she is getting better with racing." Raced by Josh Bloom, Make Mine Hennessy is the fourth winner for the talented Dolphin Street mare Danish Princess (bred and raced by Maurice Bloom), a metropolitan winner of five races who has been doing a good job at stud with her other foals including our Gr.3 placegetter Singularity, the three times stakes placed multiple city winner Lordan and the Hong Kong winner Seventy Seventy. Served last spring by Deep Impact's dual Gr.1 winning son Real Impact, Danish Princess is a half-sister to the Gr.2 placed Singapore galloper Just A Man from a prolific black type family that has produced the Golden Slipper winning successful stallion Marauding and fellow feature race winners Sacred Choice, Biscalowe, Springsteen, Mithrandir, Distant Melody, Latin News, Triple Asset, Nunkalowe, Voodoo Beat, Savanna Amour, Good Baby and Inarticulate.